P1TS is software that helps race engineers and strategists make informed race decisions by improving situational awareness from Timing and Scoring data that competitors license from IMSA. This Fact Sheet briefly illustrates how P1TS can be used to assist race engineers and strategists in solving many of the race strategy problems they face by understanding data such as: lap times, gap times, driving times, pit times, and their deltas and trends. For a thorough review description of P1TS, please refer to the following guides. P1TS Installation Guide - Complete setup, installation, performance, network instructions. P1TS User Guide - Complete instructions on how to use P1TS. P1TS has fairly modest hardware and software requirements. You will need the following attached to your IMSA MicroTik network router at the pit wall. The software is installed with a familiar Windows Setup. One or more Windows PCs to run the P1TS Server. One or more Google Chrome browser devices (Windows, Mac, tablet) to run the P1TS App. Can be run on Windows PC above. The Leaderboard table displays key data about each competitor. You may reduce noise by selecting the classes and columns you wish to Show/Hide. Your Hero car (#56), Sister cars (#65, #43 on page 2), and other cars you want to closely Follow (#17, #28, #73, #81, #44, #31) are highlighted. The Track Map individually models car movement using their earlier sector times. Hero (#56) and Sister cars (#65, #43) can be immediately located by Target Boxes and Radar Lines. Follow cars (#17, #28, #73, #81, #44, #31) are larger and have Data Boards circulating with their car markers, showing their Class Position as well as their start/finish Gaps and Closing Rates relative to your Hero. Non-follow cars are smaller reducing noise. A Hero Tail configured with your pit delta allows you to see how a stop affects pit stop overtaking. Target Boxes also highlight class leaders. A Circular map (not shown) may be used to easily visualize the circuit by time. The Sectors panel details sector and lap times for the selected car. 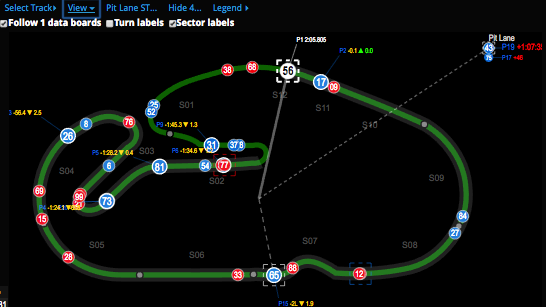 The Working lap's (L62) sectors times are recorded as sectors are completed. Faster▲ and Slower▼ arrows show how each working lap's sectors compares with his Best, Rolling, and Theoretical lap's sector times. E-prefixed (estimated) lap times (circled), predict the working lap time, by pulling remaining sector times from Best, Rolling, and Theoretical. The Pit In-Out Stints panel displays both the session chronology and summary of driver and pit lanes times for the selected car. The pit-in and pit-out time line crossings divide the chronology. IMPORTANT: The straightforward time division employed here does NOT capture the changing intricacies of IMSA's drive time calculations. Also, while delayed driver plug ins during driver changes may be manually corrected by IMSA, P1TS can only rely on information available in the timing stream. You should have an additional means of calculating drive times. 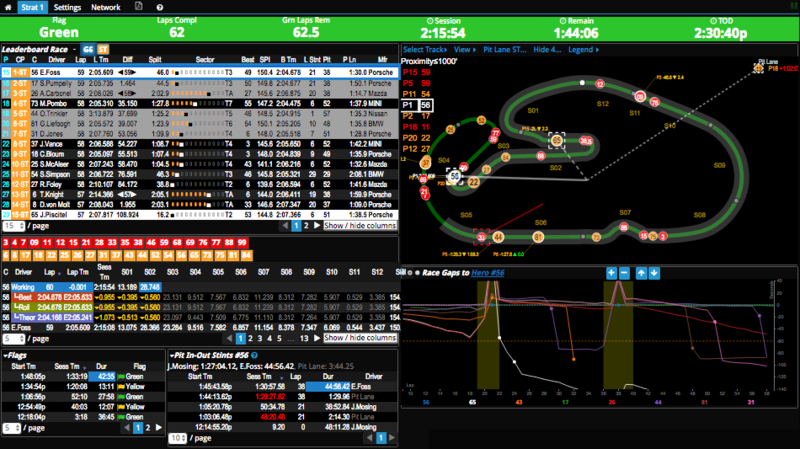 The Race Gapchart assists strategically visualizing the race via a chronological view of time gaps to the Hero car. The X axis tracks the most recent (50) laps and the Y axis displays +/- time gaps. Cars ahead of the hero are above his Y=0 line while cars behind appear below. Pit stops are indicated as circles. Yellow flag periods are displayed as vertical bands. A dotted horizontal (orange) pit stop delta line allows you to visualize overtaking in the pits. P1TS - Phoenix American Motorsports Case Study details its practical use.